I am not the kind of person who cheerfully serves people. I discovered this when I worked my first secretarial job, which I like to think of as the piece of driftwood I clung to as I abandoned the sinking ship that is public education in Kansas. After four years of grading papers, chaperoning dances, and (once) breaking up a girlfight, I was delighted to work in an office staffed with professional, sane adults. Mostly my tasks involved answering the phone and moving papers around, but one day our office was hosting a big meeting and I was “voluntold” to ready the refreshments. As I carried a tray of glasses from the kitchen, made coffee, and arranged granola bars, I felt myself growing more and more testy. I had a college degree, for crying out loud. Didn’t we have people for this? Realizing that yes, we did, and I was “people” did not improve my attitude. (Did I mention I worked in administrative offices for a church, and the people I was serving were pastors? No matter. Those people of God could get their own damn ice for their water.) I’ve been pressed into food and beverage service a few other times since then, and each time I have silently (or not-so-silently) grumped about it. For whatever reason, service feels beneath me. I’m not proud of it, but there it is. Thus Sweetbitter was not immediately relatable to me. It’s about a 22-year-old girl who moves to New York City to…well, to do whatever 22-year-olds move to New York for. (Having visited NYC exactly once and been distinctly underwhelmed by it, I don’t relate to the whole “escape your small hometown and move to the Big City where the lights are bright” thing either. When I daydream about moving, it’s to a little house surrounded by wheat fields and trees on a county road at least 30 minutes from anywhere.) The narrator doesn’t really have a plan, but she stumbles into an interview at a fancy restaurant and is hired as a backwaiter, which basically means she is the one who gets to burn her hands on hot plates as she delivers them to the tables. She also rolls silverware, makes espresso shots, learns more than you ever wanted to know about expensive wine, and does a lot of cocaine in bathroom stalls. Okay, I know I’m not selling this well at all. I get a little cranky with books that seem to assume things about the world that I disagree with, namely that life outside the city isn’t worth living. 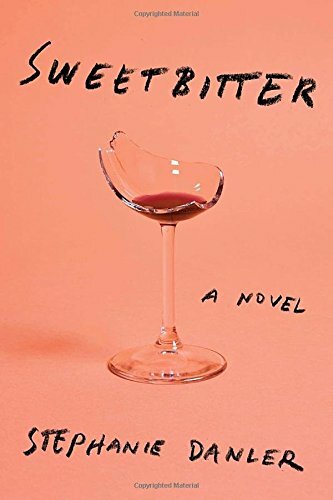 Still, here’s the selling point you’re looking for, buried underneath all my idiosyncratic complaints: despite my total lack of interest in food service, fine wine, drug use, and urban youth, I read Sweetbitter in two days. Why is it so addictive? I’m not sure, but I bet one of the characters could come up with a metaphor relating it to fancy cheese or escargots or something.